Microsoft released Windows 10’s October 2018 Update on October 2, 2018. Your PC may not automatically install this update for a few weeks, but you can download it now to get the latest features immediately. Windows 10’s October 2018 Update was codenamed Redstone 5 during the Insider Preview development process, and is also known as Windows 10 version 1809. It focuses on features you might actually use. There’s no new Paint 3D-style app here. 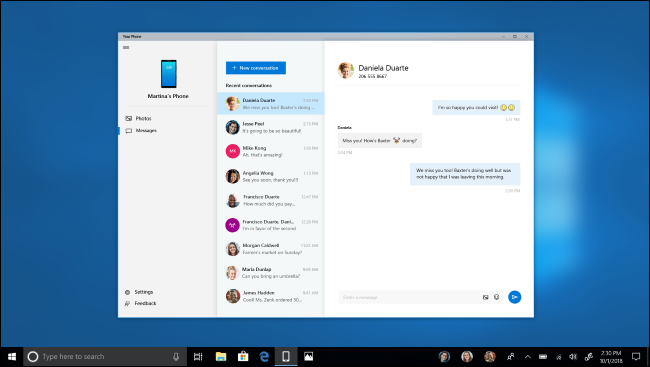 This latest Windows 10 update includes a Your Phone app that lets you text from your PC and instantly access photos from your phone on your PC, assuming you’re using an Android phone. Fewer features are available to iPhone users, but the “Continue on PC” feature will let you quickly send links from an Android phone or iPhone to your PC. Notification syncing from Android phones to PCs is coming soon, too. Microsoft has also added a new clipboard history feature you can access by pressing Windows+V. This clipboard history can sync between all your PCs, and will one day sync to the SwiftKey keyboard on your phone for easy copy-pasting. Unfortunately, the “Sets” feature that added tabs to every application on your system was removed from the final update and has been delayed. It might appear in Windows 10’s next update. File Explorer now includes a dark theme, the touch keyboard is now “powered by SwiftKey,” and the new Snip & Sketch tool makes it easier to capture and annotate screenshots. Under the hood, you’ll find easier HDR setup and mobile broadband improvements, power usage details for processes in the Task Manager, a quick slider to make all the text bigger on your screen, and better controls while projecting your screen wirelessly. Microsoft has even made a lot of improvements to Notepad, which can now handle UNIX-style line endings. Geeks will appreciate new keyboard shortcuts for copy and paste in the Windows Subsystem for Linux, and the ability to quickly launch a Linux shell directly from File Explorer. Those are just a few of the many, many improvements and changes you’ll find in this update. Check out our in-depth look at everything new in Windows 10’s October 2018 Update for more details. To get the update, just head to Settings > Update & Security > Windows Update on your PC. Click the “Check for Updates” button here. Here’s how this works: Microsoft slowly rolls these updates out, and Windows 10 normally waits at least a few weeks before installing them. 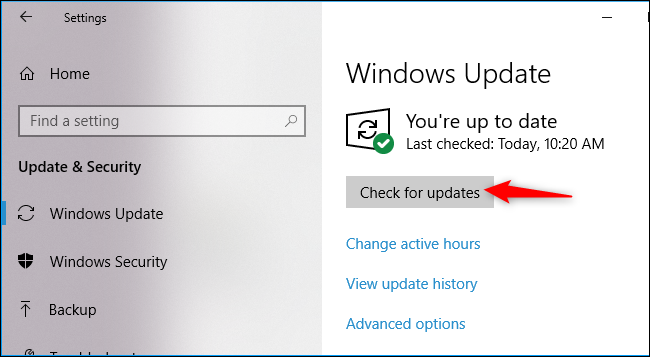 But, if you click this button, Windows 10 knows that you want the update right now, and your PC will find and install it. This update may not be available to everyone immediately, so check back later today if it doesn’t download after you click the button. 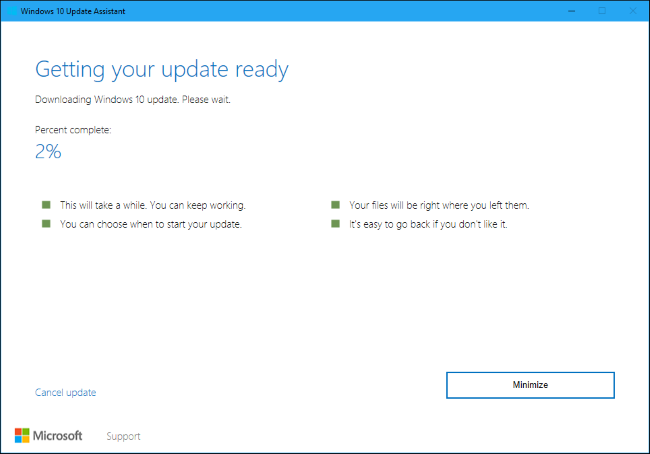 If this doesn’t work, you can also download and run Microsoft’s Windows 10 update assistant. Visit the Download Windows 10 page and click the “Update Now” button to download the assistant. Run it after downloading it and it will upgrade your Windows system to the latest available update. If you experience a problem after updating, you can go back to your previous version of Windows 10. This option is only available for the first ten days after updating, after which Windows will automatically delete the old files to free up space.